Welcome back to IN THE SHADOWS, that column where we look at character actors in the movies, especially horror movies. Today we look at Harold Goodwin, a familiar face if you’re a Hammer Film fan. Goodwin showed up as a burglar in the suspenseful opening scene in FRANKENSTEIN MUST BE DESTROYED (1969) and he also enjoyed a memorable bit in Hammer’s THE MUMMY (1959). Goodwin appeared in a lot of movies and TV shows, but for horror fans, especially Hammer Films fans, he’ll always be remembered as the ill-fated burglar who in the opening moments of FRANKENSTEIN MUST BE DESTROYED unfortunately chose to break into a home owned by Baron Frankenstein (Peter Cushing). In a memorable sequence, his character finds himself trapped in a mysterious laboratory, only to be discovered by a hideous man with a pock-marked face. The man attacks him, there’s a struggle, which damages the lab, and at one point Goodwin’s burlgar crashes into a table, knocks over a container, and a severed head spills out. He flees in terror, and once he’s gone, the pock-marked man removes his mask and we see that he is the Baron Frankenstein. A rousing way to start a very exciting Frankenstein movie, and Goodwin was a big part of this scene. Goodwin also enjoys a funny bit in THE MUMMY (1959) where he plays a man who is hired by a foreign gentleman to transport some crates full of relics to the foreigner’s house. Of course, it turns out that the foreign gentleman is Mehemet Bey (George Pastell), the man who is controlling Kharis the Mummy (Christopher Lee), and the crates of “relics” include Kharis himself! In one of the film’s more exciting scenes, the horses pulling the wagon get spooked and Goodwin’s character loses the crate containing Kharis into the local swamp. Interestingly enough, there were two Harold Goodwins working as character actors in the movies at the very same time! The subject of this article was British and appeared in mostly British movies, whereas the other Harold Goodwin was an American. The American Goodwin appeared in such films as ALL QUIET ON THE WESTERN FRONT (1930), YOUNG MR. LINCOLN (1939), and ABBOTT AND COSTELLO MEET THE INVISIBLE MAN (1951), and made movies between 1915-1973, whereas the British Harold Goodwin worked in the biz between 1946-1992. THE MASQUE OF KINGS (1946) – Goodwin received his first screen credit in this made-for-TV movie. THE HAPPIEST DAYS OF YOUR LIFE (1950)- Edwin- Goodwin’s first credit in a theatrical release was this comedy about the merging of an all-boys school with an all-girls school, starring Scrooge himself, Alastair Sim. WHO DONE IT? (1956) – Pringle- uncredited peformance in this comedy, notable for being the film debut of British comedian Benny Hill. Also featured in the cast, Dr. Pretorious himself, Ernest Thesiger, and Hammer Film character actor Thorley Walters. THE LAST MAN TO HANG? (1956) – Cheed – Goodwin adds his support to this crime drama directed by the man who would go on to direct Hammer Film’s best movies, Terence Fisher. Starring Tom Conway [I WALKED WITH A ZOMBIE (1943)] and Hammer Films’ actresses Eunice Gayson [THE REVENGE OF FRANKENSTEIN (1958)- Gayson also appeared in the first two James Bond movies DR. NO (1962) & FROM RUSSIA WITH LOVE (1963) as Sylvia,in what was originally intended to be a recurring character in the series], and Freda Jackson [THE BRIDES OF DRACULA (1960)]. THE BRIDGE ON THE RIVER KWAI (1957) – Baker – The classic war movie by director David Lean, starring William Holden and Alec Guinness. Winner of seven Oscars, including Best Picture, Best Director for Lean, Best Actor for Guinness, Best Adapted Screenplay by Pierre Boulle, Carl Foreman and Michael Wilson, and Best Music Score by Malcolm Arnold. Based on the novel by Pierre Boulle (PLANET OF THE APES). QUATERMASS AND THE PIT (TV Mini-series 1958-59- Colonel Gibson- recurring role in this famous British TV production, later turned into a feature film by Hammer Films as FIVE MILLION YEARS TO EARTH (1967). THE MUMMY (1959) – Pat – Goodwin’s first appearance in a Hammer horror film, a humorous role as a local hired to transport a crate carrying Kharis the Mummy (Christopher Lee) only to lose it in a muddy swamp. THE TERROR OF THE TONGS (1961) – uncredited appearance in this crime thriller by Hammer Films starring Christopher Lee as Asian villain Chung King. Screenplay by Jimmy Sangster. THE PHANTOM OF THE OPERA (1962) – Bill – Nice role here in the Hammer remake of Gaston Leroux tale, starring Herbert Lom as the Phantom. Directed by Terence Fisher. THE LONGEST DAY (1962)- uncredited role in this classic WWII epic chronicling the D-Day invasion. All-star cast includes John Wayne, Robert Mitchum, Richard Burton, and about 40 more major stars. THE CURSE OF THE MUMMY’S TOMB (1964) -Fred – Another brief appearance in this second Mummy movie from Hammer Films, unrelated to their first. FRANKENSTEIN MUST BE DESTROYED (1969)- Burglar, uncredited – the role I most remember Harold Goodwin for- the burglar who has the misfortune of breaking into Baron Frankenstein’s home where he must face the wrath of the Baron (Peter Cushing) himself. His final Hammer horror appearance. 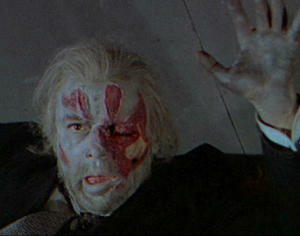 Harold Goodwin’s unfortunate encounter in FRANKENSTEIN MUST BE DESTROYED (1969). ONE FOOT IN THE GRAVE (TV Series) (1992)- Window Cleaner – Goodwin’s final screen appearance in this British TV comedy. There you have it. A partial listing of Harold Goodwin’s screen credits. Harold Goodwin passed away on June 3, 2004 in Middlesex, England, UK. He was 87. Hope you enjoyed this brief look at the career of Harold Goodwin. Join me again next time for the next edition of IN THE SHADOWS where we’ll look at the career of another character actor from the movies. Harold Goodwin – October 22, 1917 – June 3, 2004. 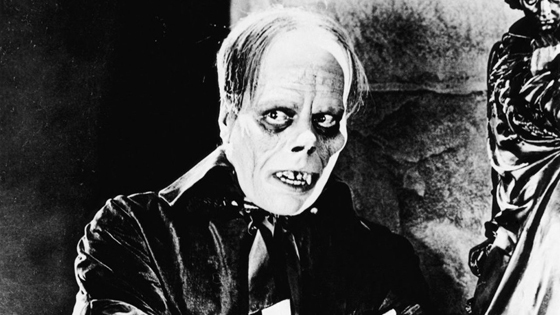 Lon Chaney Sr. remains the definitive Phantom of the Opera, even after nearly 100 years. Welcome back to THE HORROR JAR, that column where we compile lists of odds and ends about horror movies. Today we look at the PHANTOM OF THE OPERA movies. It still amazes me that the best version of this terror tale remains the original silent version starring Lon Chaney Sr. I love this movie, from its incredible sets to its amazing Phantom make-up created by Chaney himself, to the way it tells its story. It’s the most compelling and exciting of all the Phantom films. Seriously, none of the remakes come close to matching it. Based on the novel by Gaston Leroux. By far, the preeminent version of the Phantom tale. Certainly the most faithful, and the one which most fully captures the spirit of Gaston Leroux’s novel. Chaney is the definitive Phantom, even after nearly 100 years. He’s phenomenal. If you’ve never seen this silent classic, you’re missing one of the finest horror movies ever made. Don’t wait any longer. Thoroughly entertaining movie, although I think Universal got confused when they made this remake and thought they were making a straight musical. Lots of musical numbers in this one. Claude Rains makes for a decent Phantom, but his sympathetic interpretation of the character is less effective and far less chilling than Chaney’s. Memorable Phantom mask, but make-up by Jack Pierce is surprisingly ordinary. Hammer’s foray into the Phantom universe. Not bad, and Herbert Lom makes for a sinister Phantom, at least during the first half of the movie, before he follows in Claude Rains’ footsteps and turns on the sympathy. The first half of this film is among Hammer’s best, but uneven use of flashback and the emergence of a sympathetic Phantom weigh down the second half. Tepid make-up by Roy Ashton. Chaney’s interpretation keeps getting better and better. 1970s rock opera version of THE PHANTOM OF THE OPERA. Like everything else about the 70s, it’s far out, man. TV movie version of the Phantom story. Ho-hum re-telling. Inferior movie tries to take advantage of Robert Englund’s NIGHTMARE ON ELM STREET popularity, but Englund’s presence simply is not enough to lift this one up. Decent make-up, at least, but Englund’s performance as the Phantom underwhelms. Dark, violent version lacks imagination. Elaborate TV movie version of the Phantom story. It’s Dario Argento. It’s dark and it’s bloody. Film version of Andrew Lloyd Webber’s ultra-popular musical THE PHANTOM OF THE OPERA. Not bad. And there you have it, all your Phantoms in one place. And not a single one tried to saw off a chandelier! Hope you enjoyed this list of PHANTOM OF THE OPERA movies. See you next time on another HORROR JAR. Welcome to another edition of In The Shadows, the column where we honor character actors from the movies, especially horror movies. Earlier in this column we looked at the careers of Lionel Atwill, Dwight Frye, and Hammer favorite Michael Ripper. Today we look at another character actor from Hammer Films, Thorley Walters. If you’ve seen your share of Hammer Films, chances are you’ve seen Thorley Walters. Walters usually played a pompous stuffy type, a bumbling buffoon, or a mixture of the two. Some standout roles include his performance as Ludwig in DRACULA- PRINCE OF DARKNESS (1966), in which he played a character very similar to Renfield from Bram Stoker’s novel. Ludwig is a man who had once visited Castle Dracula and had left the castle somewhat insane and still under Dracula’s influence. When the young couple fleeing Dracula (Christopher Lee) takes shelter with Father Sandor (Andrew Keir) at his monastery, where Ludwig is also staying, it’s Ludwig who invites Dracula inside. Walters was also memorable as the snuff sniffing Police Inspector hot on the trail of Baron Frankenstein (Peter Cushing) in FRANKENSTEIN MUST BE DESTROYED (1969). He chases Frankenstein throughout the entire movie but never quite catches him. Walters’ most memorable performance however, and my personal favorite, came in the previous Hammer Frankenstein movie, FRANKENSTEIN CREATED WOMAN (1969). In this film, Walters played Baron Frankenstein’s bumbling but loyal assistant, Doctor Hertz. The way Cushing and Walters interact in this film is priceless, and their camaraderie here is reminiscent of Sherlock Holmes and Dr. Watson. In the entire Hammer Frankenstein series, Walters’ Hertz is probably the best of Victor Frankenstein’s assistants. He’s certainly the most likable. I’ve always wished Walters had reprised the role. I would have enjoyed seeing more tales of Baron Frankenstein with Doctor Hertz by his side. Walters enjoyed a long film career, appearing in films from the 1930s all the way up until his death in 1991. THE PHANTOM OF THE OPERA (1962) – Lattimer – Assistant to Michael Gough’s insanely annoying Lord Ambrose d’Arcy, the true villain in this Hammer Phantom film starring Herbert Lom as the Phantom. Walters gets to roll his eyes and shake his head at Gough’s infuriating antics. Plays Dr. Watson to Christopher Lee’s Sherlock Holmes in this French, Italian, and German production directed by Hammer A-list director Terence Fisher. A muddled production. Both Lee’s and Walter’s voices are dubbed by other actors! THE EARTH DIES SCREAMING (1964) – Edgar Otis – A science fiction horror film by director Terence Fisher. DRACULA- PRINCE OF DARKNESS (1966) – Ludwig – Memorable role as Renfield-type character in this sequel to HORROR OF DRACULA (1958), again directed by Terence Fisher. With Christopher Lee, of course, as Dracula. THE PSYCHOPATH (1966) – Martin Roth – Walters appears here in a horror movie not directed by Terence Fisher, but by Freddie Francis with a script by Robert Bloch in this Amicus production. THE AVENGERS – TV series- Episode: “What The Butler Saw” (July 28, 1966) – Hubert Hemming. FRANKENSTEIN CREATED WOMAN (1967) – Doctor Hertz – My personal favorite Thorley Walters role. His Doctor Hertz is such a likeable character, and Walters and Peter Cushing work so well together it’s too bad this was the only pairing of these two characters. The best of Baron Frankenstein’s assistants in the Hammer Frankenstein series. FRANKENSTEIN MUST BE DESTROYED (1969)- Inspector Frisch – As Inspector Frisch, Thorley Walters chases Peter Cushing’s evil Baron Frankenstein across the countryside because in this flick Frankenstein must be destroyed. THE MAN WHO HAUNTED HIMSELF (1970) – Frank Bellamy – Thriller starring Roger Moore. TROG (1970) – Magistrate – Classic horror flick from the 1970s starring Joan Crawford, Michael Gough, and an ape man. Directed by Freddie Francis. Sadly, Crawford’s last film. THERE’S A GIRL IN MY SOUP (1970) – Manager of Carlton Hotel – Silly comedy starring Peter Sellers and Goldie Hawn. VAMPIRE CIRCUS (1972)- Burgermeister – Superior and very underrated Hammer vampire film. If you haven’t seen this one, definitely check it out. THE ADVENTURE OF SHERLOCK HOLMES’ SMARTER BROTHER (1975) – Dr. Watson – Again plays Dr. Watson, this time to Douglas Wilmer’s Sherlock Holmes in this silly comedy starring Gene Wilder as Sherlock Holmes’ inept younger brother. Also starring Madeline Kahn, Marty Feldman, and Dom DeLuise, obviously trying to recapture the YOUNG FRANKENSTEIN (1974) magic. Falls short. Written and directed by Wilder. THE PEOPLE THAT TIME FORGOT (1977) – Norfolk – Amicus’ sequel to their earlier hit THE LAND THAT TIME FORGOT (1975), both films starring Doug McClure. Average. THE LITTLE DRUMMER GIRL (1984) – Ned Quilley – Critically acclaimed drama starring Diane Keaton. Thorley Walters also appeared in many TV shows and miniseries. This is my latest IN THE SPOOKLIGHT column, on the Hammer Films version of THE PHANTOM OF THE OPERA (1962), up now in the May 2014 edition of The Horror Writers Association Newsletter. Remember, if you enjoy this column, my IN THE SPOOKLIGHT book, a collection of 115 In The Spooklight columns, is available as an EBook at http://www.neconebooks.com, and as a print edition at https://www.createspace.com/4293038. 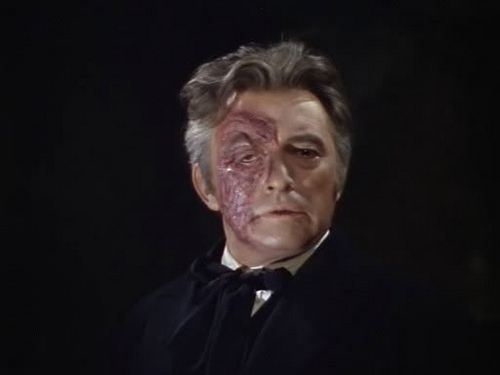 Hammer Films’ remake of THE PHANTOM OF THE OPERA (1962) starring Herbert Lom as the Phantom is not my favorite version of the Gaston Leroux tale. That honor goes to the Lon Chaney silent classic from 1925, followed by Universal’s elaborate and colorful remake from 1943 with Claude Rains. And while Hammer struck gold with their Frankenstein and Dracula remakes, their version of THE PHANTOM OF THE OPERA was not a commercial success when it was released in 1962. That being said, it’s not a bad film. It’s just an uneven one. THE PHANTOM OF THE OPERA gets off to a great start. The first half of this film is extremely well-done, and had the entire film played like the first half, Hammer would have had another classic on its hands. 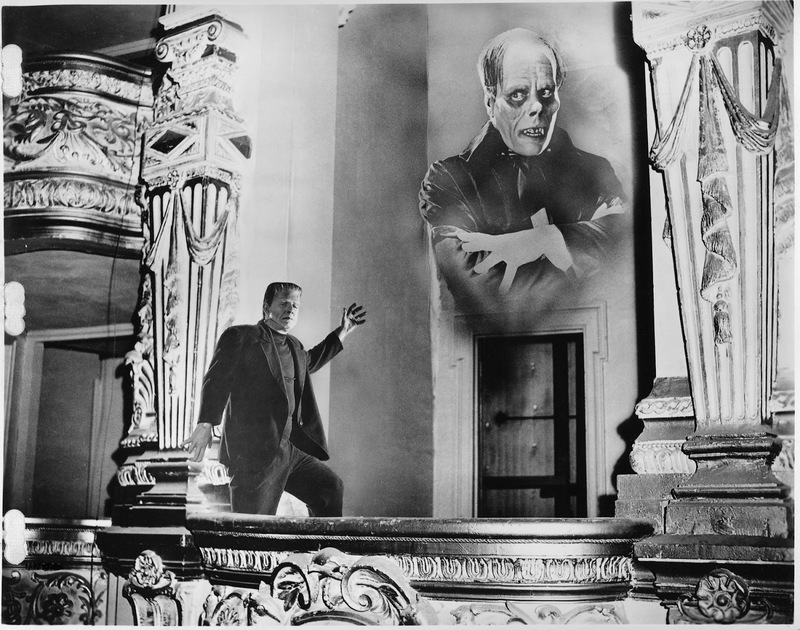 The film starts with the Phantom already at large, already wreaking havoc at the opera, which is a return to how the story was told in the Lon Chaney version. In the Claude Rains remake, the emphasis was on drama and the musical numbers, not horror, and Rains’ sympathetic character doesn’t become the “phantom” until well into the movie. Here, the menace begins immediately. There are some stylish murder scenes, showing off director Terence Fisher’s considerable talents, including a hanging body swinging onto the stage, and later, a chilling sequence involving an encounter with a rat catcher, played by Patrick Troughton. The Phantom’s first appearance is also well-done, with a very dramatic and eerie first entrance at the top of a staircase. The music is also very effective here, with a low disturbing hum whenever the Phantom is on screen. It’s a fine score by Edwin Astley. 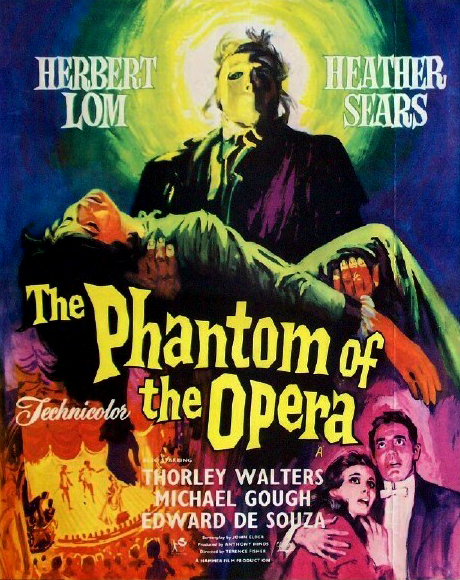 In this version, while the mysterious Phantom (Herbert Lom) is terrorizing the opera, he’s also keen on helping young Christine (Heather Sears) sing the lead role, but she’s shunned by the villainous and sexist producer Lord Ambrose d’Arcy (Michael Gough) who intends to sabotage her career because she refused to sleep with him. The opera’s director, the young and dashing Harry Hunter (Edward de Souza) is a much fairer man, and when he steps in to help Christine, he too is fired by Lord Ambrose. What’s a recently unemployed opera director to do? Why, investigate the Phantom of course! And it’s here, in the film’s second half, where it loses steam. Whereas in the first half of the movie the Phantom appears to be a menacing and frightening figure, once Hunter begins his investigation into the Phantom’s past, a sympathetic figure emerges, and we learn that the true villain in this movie is the pompous blowhard Lord Ambrose. In fact, by the time things are all said and done, this Phantom becomes even more sympathetic than the Claude Rains’ Phantom, becoming a respectable and even heroic figure by the film’s conclusion. Sadly, this doesn’t quite work. This particular interpretation of the Phantom makes sense when you realize who Hammer originally had in mind to portray their Phantom. With neither of their two stars, Peter Cushing and Christopher Lee, involved with this project, Hammer intended to turn to another even more famous star to anchor their latest production: Cary Grant. Grant had even signed a contract with Hammer to play the Phantom, but backed out at the last minute when he wasn’t satisfied with the script, a script Anthony Hinds had written with Grant in mind for the lead role, leaving Hammer scrambling to fill the part, which they did when they hired Herbert Lom. But the film was intended to be a vehicle for Cary Grant, which explains the more heroic interpretation of the Phantom. Herbert Lom is an OK Phantom, although he doesn’t come close to Lon Chaney or Claude Rains. He fares better early in the film where he’s seen fleetingly in scenes that seem to be setting up the Phantom to be like Lon Chaney’s violent psychotic interpretation, but unfortunately, this doesn’t turn out to be the case. The rest of the cast runs hot and cold. Heather Sears is rather dull as Christine, and while Edward de Souza fares slightly better as the gallant Harry Hunter, at the end of the day, he’s a rather uninteresting character as well. Only Michael Gough stands out as the vile Lord Ambrose. It’s nothing we haven’t seen Gough do before, but he’s very good at this sort of thing. The film does have a nice cast of supporting actors who probably do a better job in this movie than the film’s leads. You have Thorley Walters as Lattimer, Lord Ambrose’s assistant, who is forced to bite his tongue at Ambrose’s constant shenanigans. Patrick Troughton is a rat catcher, and appears in one of the movie’s scariest segments, and Hammer favorites Harold Goodwin [FRANKENSTEIN MUST BE DESTROYED (1969)], Miles Malleson, and Michael Ripper are also on hand, with Malleson and Ripper each playing a cabbie. Roy Ashton’s Phantom make-up is disappointing to say the least. It’s as tepid as it gets, and it’s even less chilling than the make-up on Claude Rains. And just like in the Rains’ version, we don’t see the Phantom’s face until the very end, and all too briefly. Blink and you’ll miss it. Unlike the Chaney film where we see the Phantom’s face throughout, and the famous unmasking scene happens in the middle of the movie, not the end, the unmasking doesn’t happen here until the final scene, as it does in the Rains version, which in both cases is too little too late. The Phantom’s mask in this Hammer version is actually pretty decent. I’ve always preferred the mask in the Claude Rains’ movie, but my reason for this preference is how it’s used in the film, rather than the actual mask. It’s just a white mask, but it’s the defining characteristic of Rains’ Phantom, and is used to such effect that it’s one of the most memorable parts of that movie. The mask that Herbert Lom wears, by contrast, is actually a bit more sinister looking, but it’s not used as effectively as the mask in the Rains’ film. The movie also ends way too abruptly. The story should have gone on beyond the unmasking of the Phantom, with perhaps a final act where the Phantom, upon seeing Christine nearly killed on stage, snaps, whisking her off to the “safety” of his underground lair. Terence Fisher, Hammer’s top director, was largely blamed by the studio when the film flopped, which is too bad, because it really isn’t his fault. The film’s script is the problem, not Fisher’s direction, which, during the first half of THE PHANTOM OF THE OPERA is on par with his finest work. In fact, the first half of this movie ranks with Hammer’s best horror. Unfortunately the movie doesn’t sustain this high quality through to the end. Hammer’s THE PHANTOM OF THE OPERA scores below the two versions of the Phantom story which came before it, but taken as a whole all these years later, it remains better than any rendition made since.